Region: North Olympic Peninsula - 2 hours drive from Seattle. 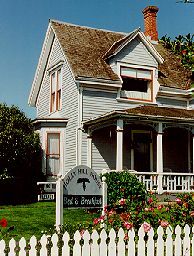 The Holly Hill House Bed and Breakfast, an elegant and intimate five bedroom Victorian Inn located in the heart of Port Townsend's Historical District. 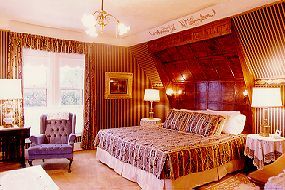 Built in 1872 by Colonel R. C. Hill, each room is decorated in the resplendent charm of the Victorian era with all the modern comforts of today. Breakfast is enjoyed in a spacious candlelit formal dining room set with exquisite linens, china and silver. Afternoon tea and delicate fresh baked pastries are served in the elegant parlor in front of the Italian marble fireplace. A cozy library coaxes you to relax and browse amongst its treasure of over 2000 books. The expansive gardens bring a special joy in the 185 rose bushes surrounding the grounds along the white picket fence. 17 ancient Holly trees guard the 100 year old upside-down Camperdowm Elm - and every turn brings another floral surprise. All private baths, wonderful antiques, and water views. This and other Holly Hill House Bed and Breakfast Inns can be found here in The Register.